Directions: There is a map with a link below. Click on it. It is great. But if you can’t scroll down. 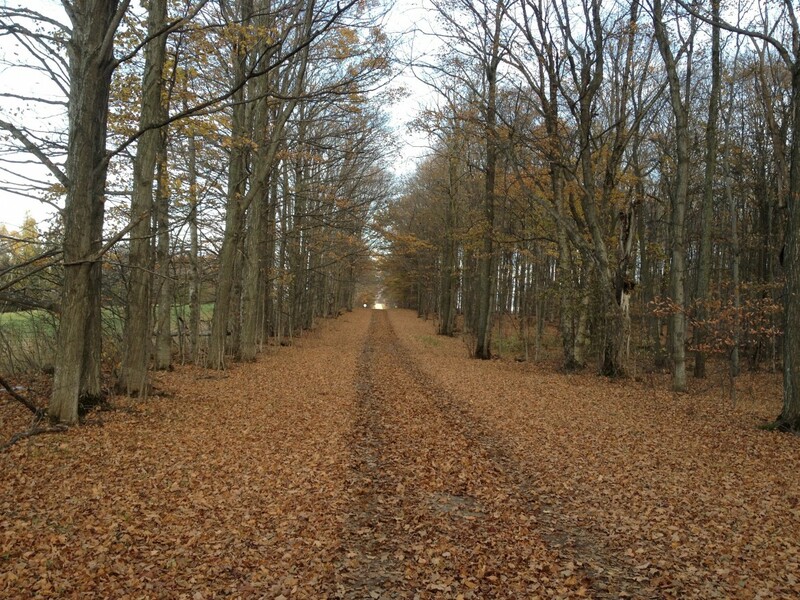 ‘1182 Nottawasaga Rd Concession 10 S, Duntroon, ON L0M 1H0‘ is the place to be. Important reminder for everyone riding the EB100 next week. The roads are not closed. You are expected to follow all traffic laws. If you are caught breaking them you will be disqualified. 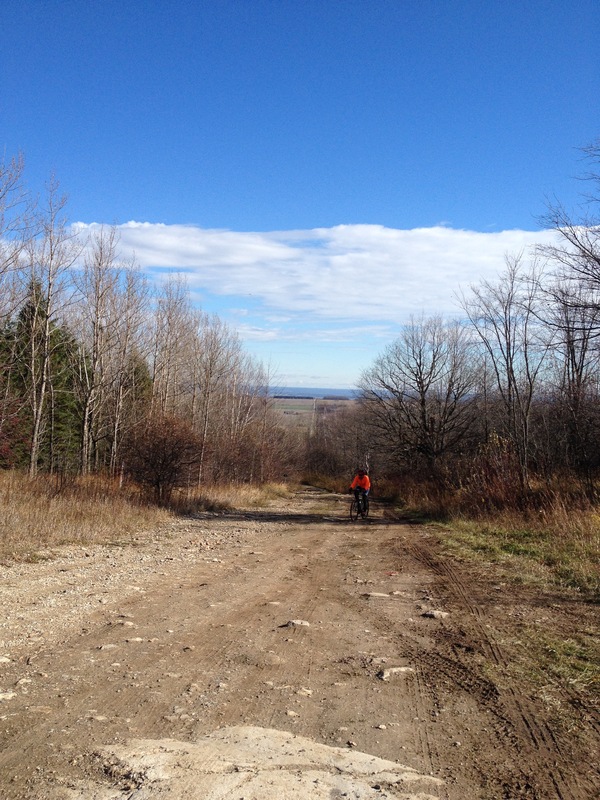 There is a lot of climbing and rough surface and the last 5k are on private property with no roads. You will not win or lose the race by running a stop sign, so don’t! The race goes through 3 different OPP detachments and they all have a map of the race. They are very supportive of the event and are focused on keeping everyone safe. Odyssey Medical will be on site to take care of any first aid issues courtesy of The Cycling Gym. If you or a rider near you is injured during the race call Odyssey Medical (on number plate) or report to one of the Aid Stations. Details: SUPER IMPORTANT!!! The first 3 k and last 5 k are on PRIVATE PROPERTY!!! DON’T RIDE ON THIS unless it is race day!!!!!! (if you do we will hit you with eggs and tell everyone that you are the reason we can’t ride there!) We have special permission. Please make your strava file private or remove the part between County Road 31 and Concession 10 Nottawasaga so others don’t ride there. Also there is a Short cut at 0.8km into the race and with 1k to go on the way back. It takes 200m off the course but it is a rocky single track (climb on the way out and decent on the way back). How Many Laps? 1. Yup, just one big loop to glory! Each distance will be one lap so PAY ATTENTION to the signs or you will go way to long, or way to short. The first scouting ride of the course was done quite happily on a ‘cross bike, but Riot did moan on a few times about wishing he had his mountain bike. 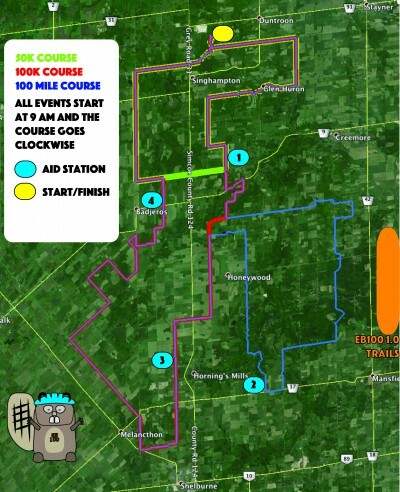 The entire 100 mile course is south of Highlands Nordic, West of Airport Road, North of HWY 89 and East of HWY 10. We can say that there is currently 20k of pavement in total on the 100 mile course. The rest is gravel and ‘Sections’. ‘Sections’ are loosely defined as parts of the route, which I would not drive, or would drive very slowly, in my Subaru Outback. And I am not very nice to my car. The current route has 7 Sections. They are fun and offer some sort of challenge. One of them is intended as a run-up, but I would guess that someone will succeed in riding it. There are climbs. Quite a few of them actually. Southern Ontario is not known as a mountainous region but we will be rolling up and down some wonderful gravel along the edge of the Niagara Escarpment as it gets close to Georgian Bay. For the 100 mile version think 6000 feet or so. Where: The start/finish is at Highland Nordic Centre in Duntroon Ontario. There will be camping on site the night before and after the race along with showers… mmmm showers…. Camping will be just $10 per night so hang out and enjoy the event. And Collingwood is a short 20 min drive away if you want some touristy stuff for Sunday. When: August 10 2019, Ride starts at 9 am. Podium will be when most of the field for that race is finished. We will give a 30 minute warning. As it is the first running of the race we don’t know how long you will take! Aid Stations: You can send out supplies (1 gallon zip-lock bag per person per station) and we will have eLoad, water, (and a little coke…) and fruit, gummy stuff and some salty stuff along with some tools and cheering. And pickles. People love pickles so…. There will be bins at registration in to which you can drop a 1 gallon zip lock bag. Each bin will be marked 1 through 4. The bins will be picked up to head out to the aid stations at 8 so drop your bag before then. 100m riders will hit all aid stations. 100k riders will hit AS1, AS3 and AS4 (don’t drop stuff in AS2!!!). 50k riders will hit AS1 only. Spectating on course: If you would like to watch someone and follow them along please refrain from driving any more than is necessary on the roads used for the race and please do not drive on the ‘Sections’ of the course during the race. All roads are open as per the Highway Traffic Act and signage, however some roads are narrower and not suitable for support/spectator traffic during the event. There are many roads you can drive on such as River Road and stop before the racecourse to watch and even ride a bike to other vantage points. Post race there will be great food and general ‘hanging around after a bike ride/race with cool people’ kind of vibe. There will be camping on site and a great resort town nearby for those with a need for the nicer things. Signage: There will be lots of signage on course. Arrows warning of a turn, arrows telling you to turn, arrows telling you that you have made the right turn, arrows telling you to go straight…. Lots of arrows. We will also have signs warning you of the ‘Sections’ with each one listed and details given in advance of the event. Great news! There will be camping on site the night before and the night after the race (with showers and bathrooms) at Highlands Nordic Centre. And there is space for Westys and trailers etc. so don’t worry. There will be a $10 fee per person payable at check in for each person sleeping over and there is a post race bbq included for Saturday (for everyone who signs up for the event). If you don’t want to camp there are lots of towns in the area to find a cool little place to hang out and Collingwood is just 20 minutes away. Thank you for joining us for the Cannondale Eager Beaver 100 p/b Dukes! About 0.8k into the race (and with about 1k to go when you are returning) you will see the Short Cut. The arrows there show you can go two different directions. It is indeed a short cut. It takes about 200m off the XC ski trail, but it has a lot of rocks in it . Choose wisely. 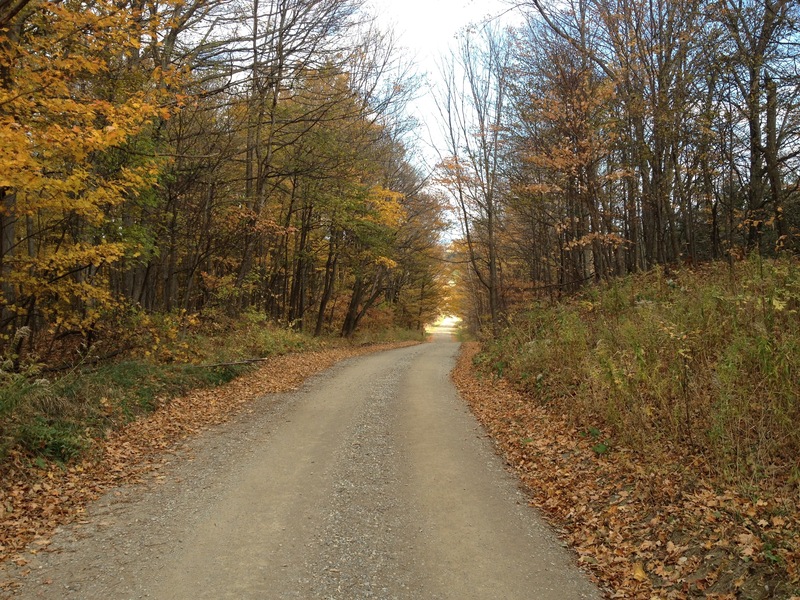 At about 2k in, you will start onto the first road. Just when it turns to gravel, there is a rock garden across most of the road. Stay to the right side. We will put arrows pointing down there to warn you. At the turn-off for the 50k and 100k courses there are large signs (same colour as your number plate) with an arrow on the bottom telling you which course goes which way. When the courses re-unite there are double arrows. There is a lead motorbike for the 100-mile course, and we will be checking the 100k and 50k routes on the morning of the race to ensure course markings are clear. The map is available for printing, the routes are posted on the event website for those who like something to follow. If you get hurt or someone else is hurt, we need to know the distance covered and which course you are doing, so that we can get to you immediately. The first aid team has a map with the distance marked so they know how to get there if you know where you are. The emergency numbers are on the bottom of your number plate. The course is open to cars and traffic except the first 3k and the last 5k. You are required to follow ALL TRAFFIC LAWS on all roads. What goes up must come down! Remember, there can be cars and motorbikes coming up the hill, and there is some fresh gravel with some SUH-WEEEET braking bumps on at least one of the downhills out there. PLEASE DO NOT LITTER! If you are found to be dropping packaging or bottles intentionally you will be disqualified from the event. We want to run this race again, and if people find litter on the road we will not get the permits to return. If you DNF, make sure you tell the timers at the finish line. This is a big area to search, and we don’t want to risk the safety of first-responders on a search for someone who is at home. We had two people not report their DNF at the El Bandito which left the volunteers at the Aid Stations sitting out there for hours after the last rider to make sure that everyone was safe. We appreciate our volunteers, please respect their time and service. Congratulations to everyone who came and raced the Eager Beaver 2018! Thanks to Duke’s Cycle for the amazing pics from Apex Race Photography.